In this post, I’m sharing with y’all my favorite, yet simple to make DIY facial scrub exfoliant that’s rich in antioxidants, calming properties and gentle, yet effective ingredients. I love DIY scrubs/exfoliants because you get to choose which ingredients go into the mix versus the conventional store brand ones, which contain dirty ingredients consisting chemicals and preservatives. My post here clarifies the dangers in conventional cosmetics. Besides, if you have just a somewhat creative streak, these dry potions are so much fun to make! The ingredients in this DIY facial scrub are all handpicked to reveal a supple, healthy, decongested, brightening, and most importantly, acne reducing complexion. All the following ingredients have a special purpose and I’m going to address each one. Ingredients are minimal because each of them work their magic in a special way! Oatmeal soothes itchy, dry skin with antioxidant + anti-inflammatory properties and provides relief to acne and oily prone skin types. The cleansing agent of oat is mostly due to saponins. Its many functional properties make colloidal oatmeal (Colloidal oatmeal refers to oats that are finely milled – in this case, per the recipe, since its ground) a cleanser, moisturizer, buffer, as well as a soothing and protective anti-inflammatory agent, making it a perfect use for a facial scrub. Pink Himalayan sea salt is my favorite salt to use in a scrub because it exfoliates the top layer of the skin as it nourishes with a wide variety of minerals that are beneficial for acneic skin. It has over 80 different minerals and trace elements, which are needed for daily basic functions of the body – this includes magnesium, sodium, potassium and iron. All of these minerals help to nourish skin and tighten pores as a result. It banishes oily prone complexions and helps with excessive oiliness overtime. In addition, it’s a natural antiseptic making it beneficial for reducing the acne harboring bacteria on the skin. **Please note, to use the fine-textured salt, and not the coarse one! Coarse types are very scratchy and can potentially scratch the upper dermis (skin’s first layer), leaving a small dent/scarring. ***Those with sensitive and dry skin types – dilute the salt twice as much before applying it onto their face, as salt can be dehydrating to skin. Matcha is high in antioxidants and epigallocatechin gallate (EGCG), which are known to help support skin health by reducing inflammation and free radicals that accelerate skin aging. Matcha contains a good amount of tannins, which gives off a somewhat bitter taste accompanied by strong astringency – black tea also contains tannins. Tannins remove harmful microbes from the body, and fight against harmful bacteria, viruses and fungi. By speeding up blood clotting, tannins also have a healing effect on cuts and wounds, which brings me to the next point – tannins in matcha actually shrinks pores and reduces the production of oil associated with acne + speed healing time of skin from overburdened and popped pimples. The dried lavender flowers provide extra exfoliation + lovely color to the scrub + smell heavenly! Lavender essential oil is known to help sebum production + contain anti-inflammatory properties to calm the skin from any redness, rash, and of course acne. In addition, lavender oil helps with fading post acne marks/hyperpigmentation if applied consistently – in this case, per the scrub recipe below, leave on face (damp) after cleansing skin for 10 minutes, then rinse off. Follow with serum/facial oil/moisturizer. Place oatmeal and dried flowers into a coffee grinder, or a small blender and pulse a few times until almost a smooth consistency. 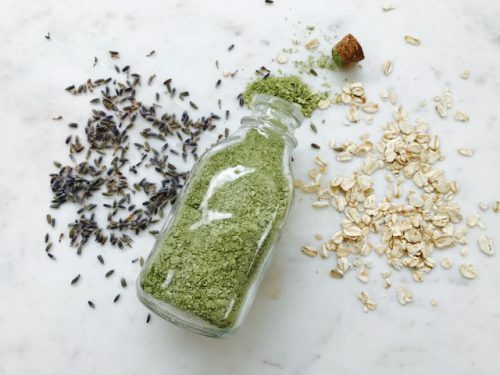 Add matcha tea to oatmeal and lavender mixture. Stir the mixture and set aside in a small bowl. Place Himalayan sea salt into an empty small cup or bowl and add 10 drops of lavender essential oil into the salt. Stir the mixture. Add the salt + lavender oil mixture to the oatmeal and lavender flowers. Stir well. Place the entire contents of the scrub into a 2-oz. bottle and store in a dry place. **Make sure the scrub doesn’t get wet inside. You can always add a teaspoon of the facial scrub mixture to a dollop of raw Manuka honey and make a micro bacterial mask. Leave on face for 20-30 minutes for extra hydration and acne reduction. Honey acts as a natural humectant that draws out impurities and soothes skin from acneic bacteria. Do you have a favorite scrub recipe? What results have you seen? Share below!